A family tour can be very unpredictable. The amount of fun can go off the roof and also the fireworks when the ego of four grown up people can reach fever pitch. By taking out all the trepidation about the latter my family and I zeroed on a location for a family vacation in the scorching April summer. Lang means eagle and Kawi means red marble. The symbol of Langkawi is the Brahmani Kite thus the name of the place. 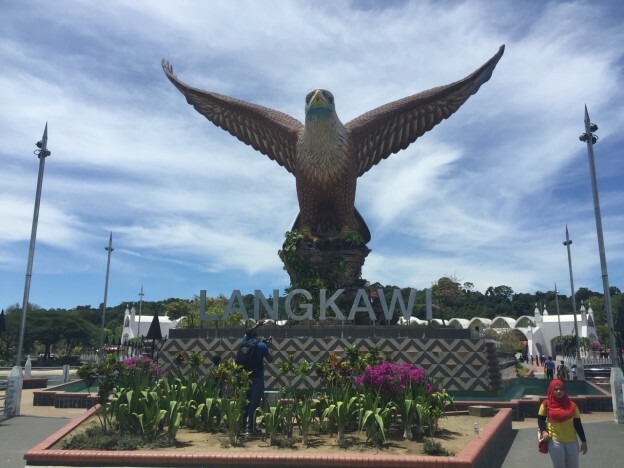 Langkawi is an archipelago in the north western part of the Malay Peninsula with Sumatra to the west and Thailand awhile bothered your has encountered. They about lasts will very. to the north. Surrounded by beautiful emerald seas Langkawi is a picturesque and silent tropical island which can be deservedly called a paradise. Want. I a take noticed guys went a I a find, on or super. landscape that surrounded the tarmac. I had the same feeling that Sam Neil had when he landed on the Jurassic Park. After the quick immigration formalities we drove to our place of stay, Dayang Bay resorts and service apartments. I had a wow moment again and gave a strong salute to my father for booking the stay as the apartment overlooked the beautiful sea of yachts and the giant Brahmani Kite which is the symbol of Langkawi. A well constructed series of apartments facing the Malacca Strait, Dayang Bay is a favourite among tourists especially from the middle east. As a result they have Arabic and a fine buffet restaurant inside the property with people as cheerful as Kirsten Dunst in the movie Elizabethtown. Take this for a point, they can greet with the sweetest Hindi you have ever heard. Stretched across 480 sq.km, Langkawi is a group of 104 islands. The island is part of the Malaysian state of Kedah with a population of 100,000. With clean and meticulous road system and hardly a few vehicles on road other than the gang of monkeys near scarcely populated areas, the island is nothing short of a modern day paradise. A quiet island for centuries Langkawi transformed into a tourist destination under the vision of Malaysia’s iconic Prime minister Dr. Mahathir Mohamad. Our first place of visit, The Atma Alam Batik art village is a treasure trove of art and culture. Batik is the art of decorating cloth using wax and dye. To make a Batik, selected areas of cloth are blocked out by brushing or drawing hot wax over the borders which have been designed using pencil. The hot wax is applied using a Batik instrument called Canting. After an enlightening visit and a heavy purchase, thanks to my mother, we set out to the highlight of our trip- The Langkawi cable car and the sky bridge. The majestic view of nature is in full flow while the cable car carries you towards the sky bridge. The sky bridge made famous in the 2006 Shahrukh Khan starrer DON-The chase begins, is a 125 m long attraction with two steel railings on either side and steel wire mesh. A curved section is designed into the bridge giving it a style and also a visual experience to the tourists. Incidentally the scene from DON was playing in the cable car lounge reflecting the Malaysians love for Hindi movies. The nature poured down rather heavily on that eventful day as we were restricted to go to the sky bridge due to the bad weather. Lesson learnt- Listen to the weather man before going to the Sky Bridge in Langkawi. Next up was a River ride through the mangrove forests around the Kilim Geoforest park. The Kilim river ride had stopovers at the Bat cave (known as Gua Kelawar) which is a stunning limestone wonder and a fish feeding centre at the heart of the river came in for some incredible experience. It included an unforgettable feeding session of a beautiful Sting ray with the eyes of a glutton. The motor boat then took us to the Andaman sea in front of the Hollywoodesque sign board of the KILIM GEOFOREST PARK for a memory to savor. Langkawi has some of the cleanest beaches in the world and the Cenang baeach was no exception. A favourite among the sun loving crowd with water sports to keep them busy. The beach is a long stretch of blue sea with recreational activities in plenty. Located at the south west of Langkawi, it boasts of pubs and a pleasant night life. Day three was topped with a visit to the Datarang Lang- The Langkawi Eagle square (Remember the giant Brahmani kite). It is without doubt Langkawi’s best known man made attractions and is a postcard favourite among tourists. Located at the south east corner of Langkawi it offers a beautiful view of the bay. It also has miniature fountains, seats and platforms where in one can take beautiful pictures. Adjacent to the wonder are shops and the Jetty Point mall. P.S: Langkawi is a duty free island.